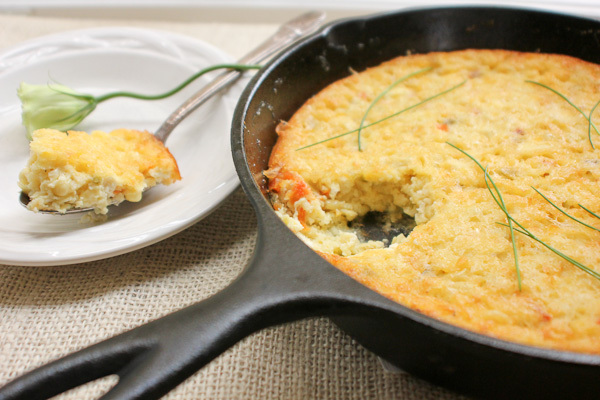 This simple corn pudding recipe marries the nutrient-dense egg with America’s favorite vegetable: corn. Throw in mild hatch chiles complemented with a subtle sweetness and warm flavor of freshly grated nutmeg and you have a winning dish that screams “company is coming”, yet is secretly guilt-free. While many corn puddings call for a generous amount of Monterey Jack, cheddar or other cheese, this luscious corn pudding is made lighter with only 4 ounces of crumbled goat cheese. Goat cheese is lower in fat and calories and has the added heart healthy benefit of being lower in sodium than other cheeses as well. Because of the incredible egg, it is also hearty and rich enough in protein to serve as a main vegetarian course in itself. Considering February is American Heart Health Month, I’d like to take this opportunity to talk about how eggs fit into a heart healthy diet. Eggs are one of nature’s most perfectly balanced foods, containing all the protein, vitamins (except vitamin C) and minerals essential for good health. My husband has heart disease and we make eggs a regular part of our diet – it is an inexpensive complete source of protein with lower saturated fat than other animal proteins. Favoring sweet and savory combinations, I decided this would be the perfect time to break out a few of the Hatch chiles that I had roasted and/or grilled and froze in baggies this past summer. Hatch Chiles are all the rage out here in the West and Southwest. They are a prized Southwestern chile grown in only one area of the U.S., the valley surrounding the namesake town of Hatch, New Mexico. They have a very short season – late summer, early fall – generally, August and September, so if you can’t get your hands on hatch chiles – Poblano or Anaheim chiles can be substituted. 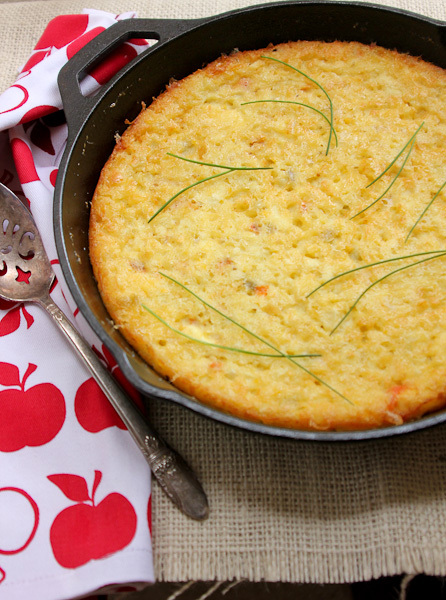 This simple corn pudding recipe marries the nutrient-dense egg with America’s favorite vegetable: corn. Throw in mild hatch chiles complemented with a subtle sweetness and warm flavor of freshly grated nutmeg and you have a winning dish that is secretly guilt-free. * Note: If you choose to use fresh corn, you’ll need 5-6 ears. Remove the husk and use a box grater to coarsely grate the kernels off four ears and use a sharp knife to remove kernels from the remaining ears. Eliminate the salt for low sodium diets. 1. Place the butter in a baking dish (an 8-by-8-inch glass baking dish or a cast iron skillet works well) and put it in the oven so the butter melts while the oven is preheating. 2. 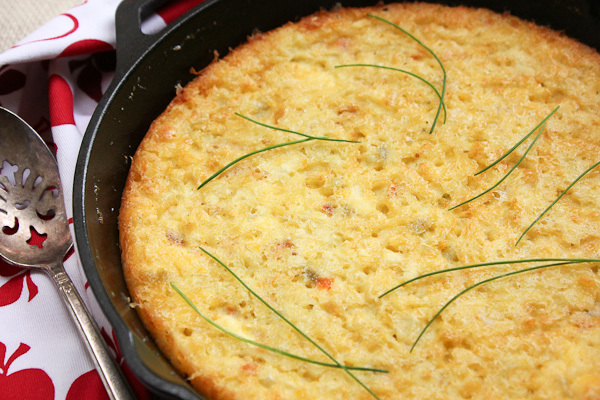 Heat a heavy pan (preferably a cast iron skillet) over a medium-high flame. When the skillet is hot, char the chiles until the skin blisters and becomes blackened, but not so much that they begin to cook. Turn with tongs to char all sides, remove and place in a paper bag (or baggie) and allow them to steam while you prepare the rest of the batter. 3. Reserve 1 cup of corn and pulse the remaining 3 cups in a blender or food processor until the corn is finely chopped. 4. In a large mixing bowl, combine the goat cheese crumbles and eggs, and whisk until thoroughly combined. Add the corn kernels, sugar, milk, flour and salt. 5. Remove the chiles from the bag and rub off the blackened skins as best you can (don’t run the peppers under water). Stem and seed them, and coarsely chop. Add them to the corn mixture. 6. When the oven has preheated and the butter in the baking dish has melted, carefully tilt the melted butter from the baking dish into the corn mixture and combine with a few swift strokes. Then tilt the buttered corn mixture back into the baking dish. Bake for 60 to 70 minutes, until a golden crust has formed and the interior has set (the pudding shouldn’t be jiggly, a toothpick inserted into the center should be dry). Disclosure: I was compensated for the development of this recipe by Safest Choice™ Eggs, all opinions expressed are my own. This looks so comforting, Priscilla! I love the hatch chiles! Looks very good Priscilla 😉 We love any and all things made with corn and chiles! I’m super excited to try this! I had a spoon corn pudding for the first time ever last month and have been waiting for a recipe to come along that is healthy. Thanks P.
This looks super duper delicious, Priscilla. This looks fabulous. I have started to eat a small amount of eggs again. So happy! AND I have Hatch chiles in my freezer too. Love this recipe. 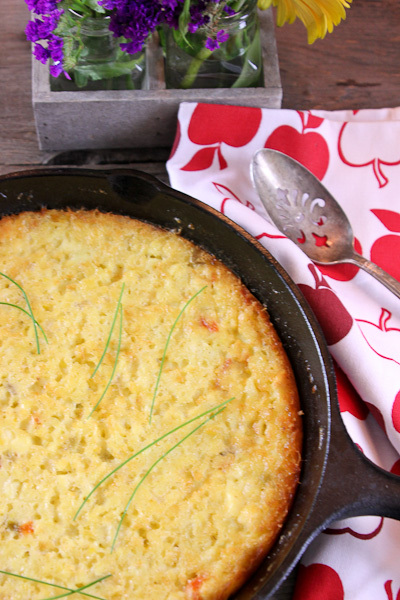 obsessed with corn pudding! i have yet to make it myself, though.